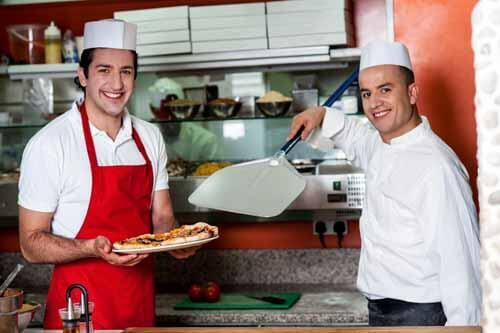 Proper restaurant management is far more than just making out the schedule for your workers. While the day-to-day tasks are certainly important as part of management, and they should never be ignored or put on the back burner. However, for restaurant management to be truly effective, it needs to encompass many other elements. The following, which includes some of those daily tasks, as well as bigger picture elements, are some of the most important things the restaurant owner and management staff should keep in mind. It can help them to run a more successful business. You have heard the phrase, “the customer is always right”. It is important to remember that this needs to be true even when the customer is wrong. You want to keep your visitors as happy as possible, and this means making sure that the staff and the management listens to the complaints and concerns of customers and takes them seriously. You have likely seen stories on the Internet where customers have taken to social media and even news outlets to voice their displeasure at the way they were treated. Staff members who have problems with customer service should not deal with the guests. 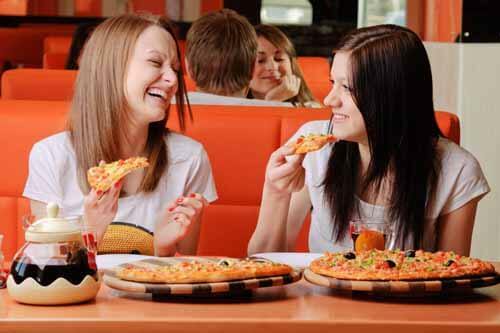 The customers should be greeted when they enter the restaurant and seated as quickly as possible. If there is a wait, inform the guest, and be sure to update them to let them know the status. If the establishment has a bar, let them know that they can have a seat at the bar until their table is ready. Rude and inconsiderate staff is a surefire way to anger customers and ensure they will never step foot into your restaurant again. The greeters and the wait staff should be pleasant. This does not mean they need to take abuse from the guests, however. If there are problems with the guests, they should contact their supervisor or manager on duty. Never let a customer leave the establishment angry. Do whatever you can to make them happy if they have a legitimate complaint. Always try to fix the problems immediately. Listen to their problems and take ownership of the mistake. If you or your staff does not agree with the customer, always stay calm and ask the customer what you could to do make things better. This could include discounting a meal or comping a meal in some cases. It is important to make the customer happy, but not to be taken advantage of – try to negotiate an agreement that will work for the both of you. Empathize with the customer, and apologize to them. The sooner you can solve the issue the better. Just as you will want to keep your guests happy, the restaurant owner and management should work to keep their employees happy, as well. When you have a happy staff that enjoys coming to work, it makes the restaurant run smoother and more efficiently. There are plenty of ways that you can make sure you are taking good care of the employees, which can help you retain the best. First, you need to offer fair wages to those who are working for you. Even if the job itself is great, if you are not paying well, those employees are going to want to seek employment elsewhere. They are working to earn a living. If there are any conflicts between employees, it is important to resolve them as quickly as possible while staying neutral. Listen to both sides of the argument and come up with a fair and effective solution. If there is one employee who is causing serious problems or who is constantly at odds with others, talk to them about the issue. In the end, if the employee continues with that sort of behavior, it is generally best to let them go. You never want to let “one bad apple spoil the bunch”, as they say. Providing performance based perks for the employees is a good way to make them happy and more productive, as well. It is important that you have a perk system set up for the various types of jobs in the restaurant, as well, not just the wait staff. Those who are doing the cooking and the washing should be involved in the perk system, as well. Ideally, you should have a workplace that is fun. By offering team-building activities, outings, contests, celebrations for birthdays and employment anniversaries, you are showing the employees that you care about them and that you want them to continue working for you. If you do plan to have outings with the crew at the restaurant, you might want to schedule more than one for the same activity, just so everyone will have a chance to attend. After all, you will still need to have staff at the restaurant to take care of business. Another option is to have certain activities for after the restaurant has closed for the day. Just make sure you never exclude anyone from the events. It is important to remember that keeping employees happy does not mean that the management at the restaurant can be “walked all over” by the employees. It is about treating the employees well and fairly, and always getting the job done the right way. 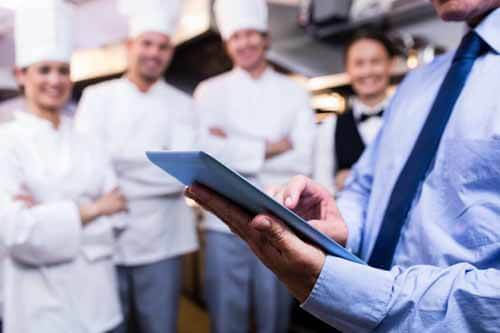 Along with treating the employees well, another major part of proper restaurant management is making sure that all the job descriptions and restaurant policies are made clear to them from the beginning. Much of this will be covered during the training period for new employees. The employees should know their role in the company and who they can talk to if they have questions or problems. An employee handbook, even for a small eatery, is a good idea. This handbook should contain all the policies in the restaurant including handwashing, talking to customers, dealing with complaints, where and when they can take their breaks, and more. If the employees have questions, they should always feel free to speak with the managers for clarification. None of the employees should ever feel afraid to speak with a member of the management about policies, or about any questions they have. You also need to be clear when it comes to work schedules. They should be posted in the same place each week, and they should be posted early in the event there are conflicts or if people want to switch shifts, if you allow for that. Ideally, you will post the schedules online, as well. You could email the schedules, but doing that is riskier. There is always a chance that an email did not go through. Having an online hub, which provides the schedules, along with a digital copy of the employee handbook, is generally a more effective option. They can always consult the site when they have questions or need to see their schedule. Still, you should have copies of the schedule up at work, and you should also have copies of the handbook. As a restaurant owner or manager, it is important to get a feel for how customers see your restaurant even before they enter the establishment. You should look at the restaurant with a fresh set of eyes, and make sure that you also engage your other senses. From the outside, does it appear inviting and clean? If you have landscaping around the restaurant, such as bushes or flowers, they should be well-maintained. The walkways should be clean and they should have no hazards on them that could cause a trip and fall incident. The windows should be clean, as well. Upon entering the restaurant, what are the first things the guests will experience? It should be inviting. If you have music playing, it should not be blaring, and it should add to, rather than detract from, the overall ambiance of the eatery. Do you have proper lighting? 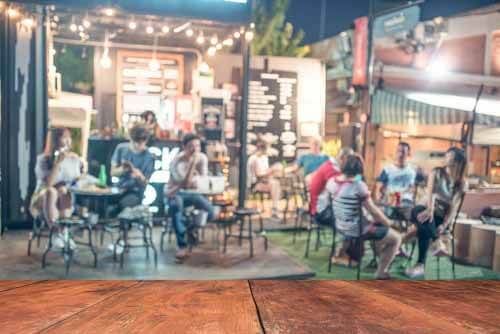 The type of lighting you have may vary based on the type of restaurant you have. Those who are trying to evoke a romantic atmosphere tend to want dimmer lighting, while a buffet will have more lighting since people are going to be going back and forth to their table. Even in dim lighting, it should never be so dim that people have trouble seeing and navigating their way to the tables and the bathrooms. Speaking of the bathrooms, they need to be kept clean always. Staff should take the time to check the bathrooms regularly and have them cleaned as needed. They should also take stock of the soap, towels, and toilet paper to make sure the customers never run out. The kitchens and prep areas, as well as the storage areas need to be cleaned and well-maintained, too. These are areas that tend to get dirty, and if they are not cleaned properly, it can cause all manner of problems. It could lead to violations of the health code, it could attract vermin and other pests, and it creates an unpleasant working environment. Cleaning should be a part of the duties of many of the people who are on staff. Everyone should have their role for cleaning, in addition to their other duties, and they should be sure to clean thoroughly. This also goes for the bussers who are clearing away plates and glasses from the tables. Before seating any new guests, the tables should be spotless. Ultimately, part of restaurant management is making sure that the restaurant has a good atmosphere. It will help to set the mood of those who come into the restaurant. Music is a good addition, but remember to keep it low enough that people can hear others in their party when they are speaking. Listen to suggestions from customers and employees when it comes to improving the atmosphere of your restaurant. They may have some good suggestions that are easy to implement and that can make your eatery a more welcoming and friendly place to visit. The menu that you have for your guests should not be one that is overcomplicated, confusing or that has a complex layout. It should always be easy for the customers to find just what they need whether it is appetizers, main dishes, drinks or dessert. Arrange the items on the menu in logical groups. You should also have your menu on your website, and it should have the same layout as the menus you use in your restaurant. If someone has already looked at the menu you have online, having a menu with the same basic layout when they arrive at the restaurant is a feature they will appreciate, even though they might not notice it. If it doesn’t have the same layout though, there is a chance they will not be able to find the items that they had their heart set on ordering. When you add new food, or remove old dishes, you need to update your menu. You need to do this for your online menu, as well as the in-restaurant menu. This way, there will be no issues with customers trying to order items that are no longer served at the restaurant. Updating the menu is also essential because you will likely need to change prices for dishes over time. If you have weekly specials, you might not want to print out new menu pages for them. 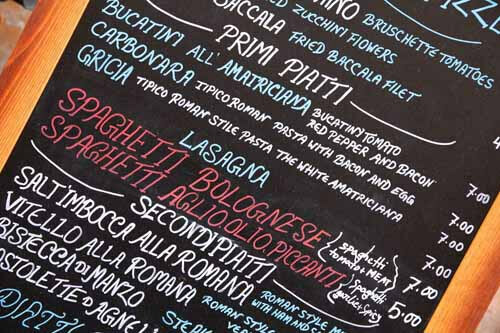 You can write the specials on a chalkboard at the entryway, place the pages in placards on the table, or have your servers memorize the specials each day to tell the guests. These are some of the most important things to consider for those who are managing a restaurant, as well as for the owners of the restaurant. Taking care of the customers and the employees, and providing high quality food are the key ingredients to any successful restaurant endeavor.